Disasters tend to bring out the best (and worst) in people as communities fight to regain what was lost. During the 1906 catastrophe in San Francisco, firefighters and police, together with the U.S. Army and Navy, worked hard to save what they could of the city. 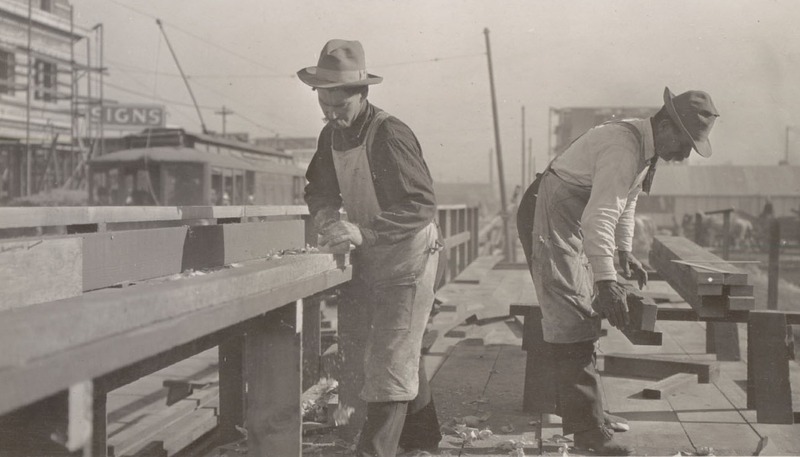 Risking their own lives to help others, some have written accounts of how many individuals worked together to save, and restore, San Francisco. During the memorable 18th and 19th every hotel and bank, every large store and nearly every storeroom and wareroom in the city had been destroyed, three hundred thousand people were homeless, and thousands more were left without the means of livelihood. Abundant use was found for all the troops at our disposal, for the conflagration with a mile of front was rapidly eating its way into the heart of the city, and the streets were black with tens of thousands of people who were kept at a distance of two blocks from the fire by strong detachments of troops. Before ten o’clock [on the morning of the quake] the troops from Forts McDowell and Miley had arrived and there were now on duty about seventeen hundred regulars. They were used in various ways, guarding the people, the Sub-Treasury and the Mint, patrolling the streets to prevent looting, maintaining fire-lines, and taking a hand at the hose wherever there was sufficient water pressure to enable the firemen to accomplish anything. In the meantime, dynamite had been obtained; and then began the series of terrific explosions that was to shake the city for the next few days. The amount of dynamite available in the earlier hours of the day was too small to accomplish much, but a tug was obtained and a number of trips made to the works of the California Powder Company at Pinole, the tug returning each time laden with explosives. I doubt if anyone will ever know the amount of dynamite and guncotton used in blowing up buildings, but it must have been tremendous, as there were times when the explosions were so continuous as to resemble a bombardment. After the rubble was cleared, the new San Francisco sprang to life more quickly than anyone could have imagined. Some alive at the time thought the new city would be far better than the old. Today - more than one hundred years later - many people agree. Bos, Carole "THE PEOPLE REBUILD" AwesomeStories.com. Apr 01, 2006. Apr 26, 2019.